How Much Weight Can You Lose Doing Intermittent Fasting? 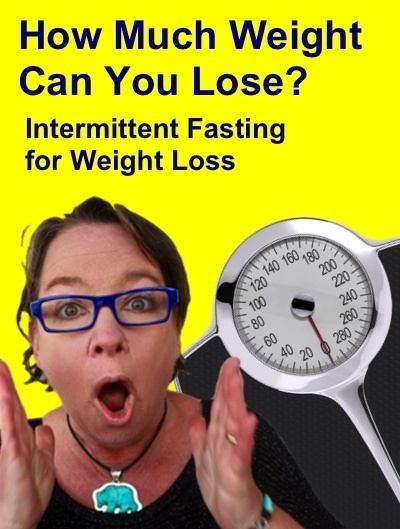 I find intermittent fasting to be the fastest and easiest weight loss program I’ve tried, and I’ve tried them all over the last almost-50 years. I lose 10-15 pounds a month with intermittent fasting whereas with a very-low-carb diet (under 25 grams or so of carbs a day), I lose 4-5 pounds a month. The intermittent fasting is easier and more effective. In that 10-15 pound range, I hit the low end when I am more sedentary and higher in caloric intake and I hit the high end when I am getting moderate exercise daily and/or very calorie-restricted. You may lose more or less depending, of course, we are all wired a bit differently. In my case, I eat one meal a day (OMAD) in a one-hour window. I eat low carbohydrate foods in that window to ensure that I stay in ketosis, forcing my body to burn fat for fuel rather than relying on sugar fuel from simple sugars and carbohydrates. If you eat a burger in your eating window, your body is going to start burning that hamburger bun instead of your fat and it may take two to three days to earn your way back into ketosis, slowing down your overall weight loss. In fact, if you find your weight loss has stalled or slowed, your carb intake is the first thing I would look at. The second thing is your overall calorie intake. How to speed up your weight loss? 1) I go on a multi-day water fast. 2) I eat a calorie-restricted meal in my one meal a day (OMAD). Both cut calories. The first is just an extreme version. Obviously I lose more weight on a complete water fast but it doesn’t always work in my life. In one case, I planned to fast for 10 days and made it to Day 3 and just felt very tired. My hair started falling out just a bit. I took a small step back and realized that I needed to supplement my diet with vitamins and minerals, so I stopped the complete fast, moved to a calorie-restricted model, and began a normal regimen of vitamin and mineral supplementation until I felt built up enough to try the water fast again. In my first big water fast that jump-started my whole program, I lost 28 pounds in a 16-day fast. In the very first 3 days of that initial 16 pound fast, I lost 15 pounds, likely a lot of water weight. After my initial 15-pounds of water on that 16-day fast, I lost about a pound a day. I find generally that if I water fast for a day, I will lose about a pound and maybe a bit more. The range seems to be in the 1/2 to 1 1/2 range among other fasters. If I eat daily but restrict my calories to about 500, I lose about a half a pound a day. In my case, if I ate one meal every other day, I lose 15-20 pounds a month. This strategy is very effective and I find it to be do-able. You can hit the vitamins and minerals on your eating day and keep your eating in the low-carb goal range and lose quite a bit of weight pretty quickly. How much exercise does this include? Just to clarify, during my initial weight loss, my exercise routine has been fairly minimal. The weight loss is due to the eating and fasting program rather than exercise. If you are exercising (good for you! ), you will lose more.